I like to set up little art activities before I go to bed so that when Caleb wakes up in the morning he wanders over to his little table and engages in the activity. One of my favorites is to do drawings in sharpie on paper that I then tape down to his drawing board. 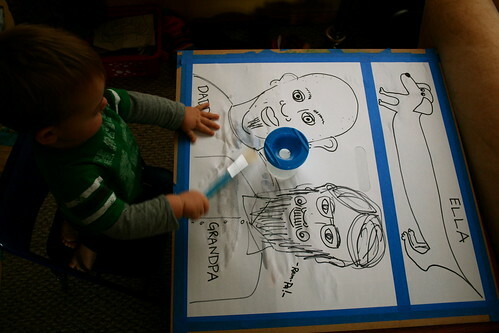 For the record, I strongly suggest that you use drawing boards with kids. They make the paper more stable and less likely to rip. Oh, and you can move the drawing board around the house or outside easily. I’ll tape several different things down including blank paper, pages from coloring books, magazine prints, etc. This drawing is of Daddy, Grandpa, and Ella. When he came out to this, he kept shouting, “Grandpa! Dada! Ella!” as he worked. Here I let him “paint” with water. Later he added crayon and then some watercolor paint. To finish, we cut out pictures from an old magazine and Caleb taped them on the paper where he wanted them. We finished it with some tempera paint. This whole process takes about a week and I love that he gets to see something slowly progress into something bigger. I’m trying to think of some good ways to display his finished artworks. Currently they go on the fridge or on the surfboard clips in his bedroom. I’m thinking up some ideas using old picture frames and clips that I think could be cool, but I’m not in a hurry. Maybe I’ll get inspired to that end this summer!